There are many options of where to go when it’s time to get your car’s oil changed, including dealers, general repair shops, chain repair shops and “quick lube” shops that specialize in oil changes. Picking the right one is a matter of balancing convenience, quality and cost. Keeping on top of your car’s maintenance schedule is critical to the life of your engine, and ignoring it could cost you dearly when the added wear and tear catches up with the motor’s internal components. However, there’s often a difference between the services you’re offered and the services you actually need. What should you do if the shop says you need a new air filter or have the radiator flushed? What type of oil should you ask for? What services and add-ons are useful, and which should you pass on? Where Should I Get My Oil Changed? Many people will choose a shop strictly on the price of the service, but that’s not always the best idea. While the advertised price may be low, there can be a lot of hidden charges that result in a final bill that’s much higher than you planned on. Call ahead and get an estimate so you know what you’ll be dealing with. Some consideration also needs to be made to the oil being used. Many new cars require synthetic oil, and there are some vehicles that even have different intervals depending on the oil used. For example, in some engines, Toyota recommends getting a change every 5,000 miles with conventional oil, or 10,000 miles if synthetic oil and a high quality filter are used. While the synthetic oil may be more expensive up front, it may save you money in the long run thanks to less frequent service. Unless specifically stated, advertised prices for oil changes are for conventional oil. How much service do you want when you have it done? A dealer or general repair shop will usually do a detailed inspection of your vehicle while it’s being serviced, and they may find issues before they become major repair problems. Some shops offer other maintenance services, while others only do oilchanges or other fluid-related services like radiator and transmission flushes. The level and quality of service can vary widely from shop to shop, so it’s a good idea to read customer reviews to find out what you can expect to experience if you bring your vehicle in. This includes local chain stores, as many use a franchise system with different owners, and even corporate-owned locations can vary depending on the managers and technicians they employ. Is your vehicle under warranty? In many cases, the manufacturer’s warranty will include services like oil changes free of charge at dealerships, particularly for luxury brands. If it’s not covered, then you can usually save a lot of money by steering clear of dealers. Is your car an import or exotic? If your vehicle is rare or built to a very high level of performance, it’s best to take it to a shop that specializes in such vehicles. Some of these vehicles require specialized tools and methods, so it pays to have work done by technicians prepared to work on them. Even though using a high quality synthetic is more expensive compared to a conventional oil, it may be worthwhile just so you don’t have to get your car serviced as frequently. You’re looking for a “basic oil change” which should just include changing the oil, oil filter, and maybe an oil plug seal. You should only upgrade to a different types of oil or filters if you think they’re necessary. Extra services included with the service like a tire pressure check are fine, but you are not required to pay for additional services. If the technician does find a possible issue, it’s up to you to decide if you want the shop to address it, do the servicing yourself, or have it fixed at another shop. How long an air filter lasts depends on the design of your car’s intake. Some models only last 9,000 miles, while other can go 30,000 miles or more. A little visible dirt is normal and does not mean it need to be changed. The cabin filter removes contaminants from air going through the HVAC system before it goes through the fan and interior vents. This filter is usually located behind the glove box and can be removed without tools. Check the owner’s manual for the correct procedure: this is one job you may want to tackle yourself. Like air filters, the life of a cabin filter can vary depending on the design, from 10,000 to 30,000 miles. Depending on the transmission, the fluid may need to be changed every 60,000 miles, or it could be designed to last the lifetime of the vehicle. Some new “sealed” transmissions don’t even have a replaceable filter. Do your research before saying yes to a transmission flush. If you have a CVT, it’s extremely important that the correct fluid is used and it’s filled to the right level to prevent overheating. When in doubt, have this service performed by a dealer. Like oil and transmission fluid, coolant lasts much longer than it used to, sometimes as long as 150,000 miles or 5 years. Make sure your car actually needs a radiator flush before signing off on one. Only buy new standard wiper blades if they don’t move smoothly across the windshield when it’s raining. Switching to winter blades may be a good idea if you live in an area with heavy snow fall because they’re built to resist ice build up. Changing wiper blades is fairly simple, so you may want to do this yourself. 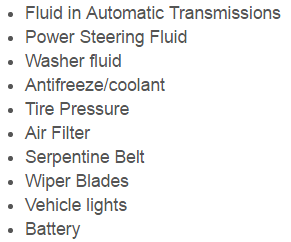 Adding windshield wiper fluid is even easier than changing the cabin filter: just open the hood, find the cap labeled with a wiper symbol, open it, pour in the fluid, and close the lid. With fluid available for a couple bucks a gallon and at almost any parts store, discount store and grocery store, you don’t even have to go out of the way to buy it. Some quick change oil shops push for oil changes every 3,000 miles, but modern engines have intervals ranging from 5,000 to 15,000 miles, and some even have oil sensors that tell you when the oil needs to be changed. Go by the recommendations of the manufacturer in your owner’s manual, not the shop. 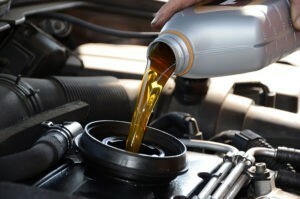 We’re interested to know – where did you get your last oil change done and what was your experience like? Let other readers know by leaving a comment below!